This is a fantastic opportunity to work with a close knit and hardworking team. This job will be varied and guarantees that no two days will be the same. It will be hard work, but very rewarding and a great opportunity for someone who has experience within the creative industry to join a company with a fantastic reputation and huge ambition. Liaise with all key account contacts, develop each account to increase revenue, keep up to speed with Business developments and identify and develop opportunities. Work with clients to identify best solutions. Excellent problem solving and pro-activeness skills. Commercially minded, looking at where we can add value. Liaise with internal teams to plan, develop and deliver appropriate products/solutions. Produce schedules and write design briefs. Proof and check work to ensure 100% accuracy. Manage client’s budgets – making sure work is delivered on time and on budget. Keep clients up to date at all times. Estimate design work with support from Creative Director and Account Director. Make sure all work is invoiced correctly and on time. Attend client meetings, trade events, networking opportunities when required. 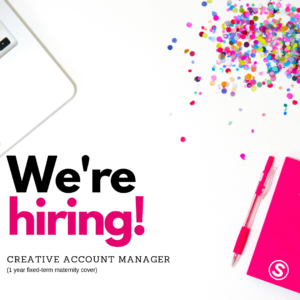 Outstanding account management skills and a good understanding of building positive relationships with clients. Experience as a client in a relevant business environment and/or experience managing accounts in a supplier environment. Experience in Marketing or Communications, planning and delivering campaigns with multiple elements and channels. Experience working in a design environment including briefing, managing and planning. A good understanding of print/production. Driven and confident to get results in the right way. Experience in the Education, Financial or Catalogue sectors would be an advantage. Experience managing data driven multiple page documents such as catalogues, reports or prospectuses. Experience managing and delivering digital solutions to clients. Please email Account Director, Fiona Ross with your CV and covering letter.